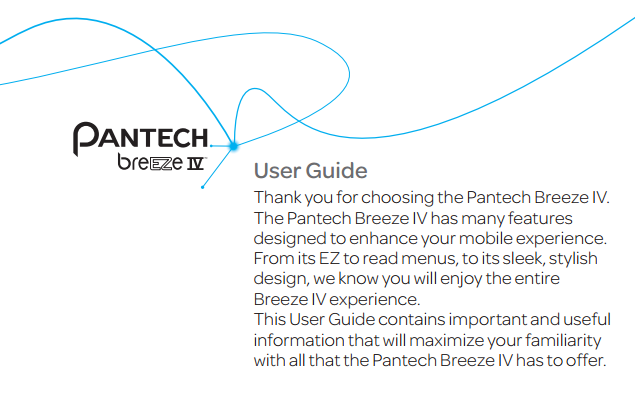 For owner of the Pantech Breeze IV, now you can download the manual in pdf format. The Pantech Breeze IV Manual is very importnt because provide many tutorial or instruction to using this phone. In addition also provide about Troubleshooting checklist. As we know, the Pantech Breeze IV is Clamshell phone with internal (3.0 inches) and external display (1.44 inches). It's equipped with 3M CMOSb Camera. This phone has physical dimensions of 106.5 mm X 53 mm X 17.4mm. For network support GSM/GPRS/EDGE with frequency of 850/900/ 1800/1900 MHz, and UMTS/HSDPA network with frequency of 850/1900/2100 MHz. The Pantech Breeze IV user manual consisting of 201 pages. It's available in english and spanish language. It's devided into 7 section. The manual contains information such as phone overview, using menus, setting phone, using PC suite and memory card, Making, receiving and ending a call, using address book, using messages, using camera, using bluetooth, using web browser, and settings guide like time and date setting, display settings, security, updating softaware, reset tutorial, troubleshooting and more.